Investing in small cap stocks has historically been a way to outperform the market, as small cap companies typically grow faster on average than the blue chips. That outperformance comes with a price, however, as there are occasional periods of higher volatility. The fourth quarter of 2018 is one of those periods, as the Russell 2000 ETF (IWM) has underperformed the larger S&P 500 ETF (SPY) by nearly 7 percentage points. Given that the funds we track tend to have a disproportionate amount of their portfolios in smaller cap stocks, they have seen some volatility in their portfolios too. Actually their moves are potentially one of the factors that contributed to this volatility. In this article, we use our extensive database of hedge fund holdings to find out what the smart money thinks of Athene Holding Ltd. (NYSE:ATH). Athene Holding Ltd. (NYSE:ATH) has seen an increase in activity from the world’s largest hedge funds recently. ATH was in 43 hedge funds’ portfolios at the end of the fourth quarter of 2018. There were 42 hedge funds in our database with ATH positions at the end of the previous quarter. 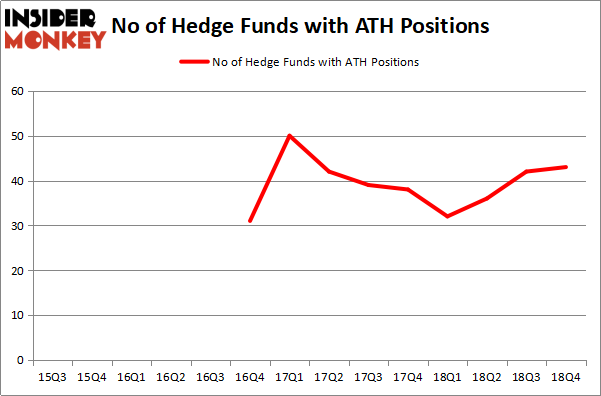 Our calculations also showed that ATH isn’t among the 30 most popular stocks among hedge funds. In today’s marketplace there are several tools market participants employ to value stocks. A pair of the most under-the-radar tools are hedge fund and insider trading activity. We have shown that, historically, those who follow the top picks of the elite hedge fund managers can outclass the market by a very impressive margin (see the details here). Let’s analyze the key hedge fund action regarding Athene Holding Ltd. (NYSE:ATH). What have hedge funds been doing with Athene Holding Ltd. (NYSE:ATH)? Heading into the first quarter of 2019, a total of 43 of the hedge funds tracked by Insider Monkey held long positions in this stock, a change of 2% from one quarter earlier. On the other hand, there were a total of 32 hedge funds with a bullish position in ATH a year ago. So, let’s see which hedge funds were among the top holders of the stock and which hedge funds were making big moves. More specifically, Brahman Capital was the largest shareholder of Athene Holding Ltd. (NYSE:ATH), with a stake worth $190.4 million reported as of the end of September. Trailing Brahman Capital was Samlyn Capital, which amassed a stake valued at $155.1 million. AQR Capital Management, GLG Partners, and KG Funds Management were also very fond of the stock, giving the stock large weights in their portfolios. As industrywide interest jumped, some big names have jumped into Athene Holding Ltd. (NYSE:ATH) headfirst. Azora Capital, managed by Ravi Chopra, assembled the biggest position in Athene Holding Ltd. (NYSE:ATH). Azora Capital had $23.9 million invested in the company at the end of the quarter. Peter Seuss’s Prana Capital Management also made a $14.9 million investment in the stock during the quarter. 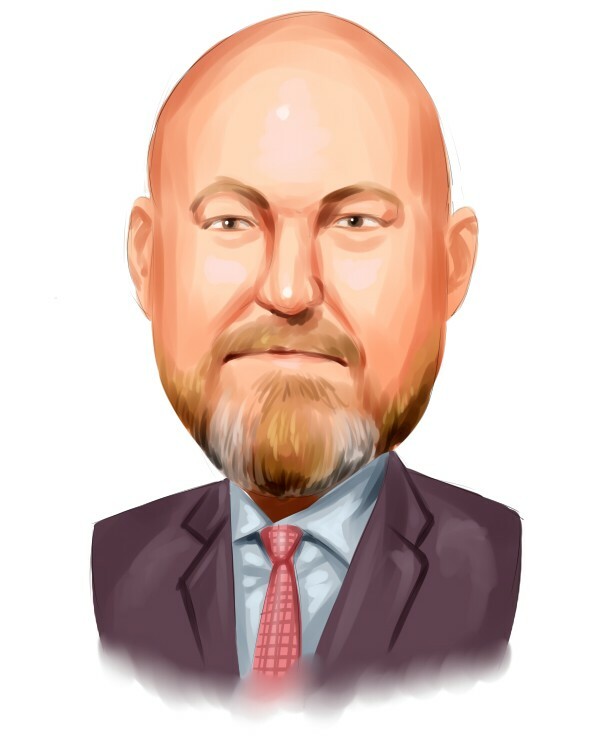 The other funds with new positions in the stock are Peter Rathjens, Bruce Clarke and John Campbell’s Arrowstreet Capital, Brandon Haley’s Holocene Advisors, and Jay Petschek and Steven Major’s Corsair Capital Management. Let’s now review hedge fund activity in other stocks – not necessarily in the same industry as Athene Holding Ltd. (NYSE:ATH) but similarly valued. We will take a look at MarketAxess Holdings Inc. (NASDAQ:MKTX), Interpublic Group of Companies Inc (NYSE:IPG), China Eastern Airlines Corp. Ltd. (NYSE:CEA), and Leidos Holdings Inc (NYSE:LDOS). All of these stocks’ market caps are similar to ATH’s market cap. As you can see these stocks had an average of 18.5 hedge funds with bullish positions and the average amount invested in these stocks was $314 million. That figure was $1280 million in ATH’s case. Interpublic Group of Companies Inc (NYSE:IPG) is the most popular stock in this table. On the other hand China Eastern Airlines Corp. Ltd. (NYSE:CEA) is the least popular one with only 2 bullish hedge fund positions. Compared to these stocks Athene Holding Ltd. (NYSE:ATH) is more popular among hedge funds. Considering that hedge funds are fond of this stock in relation to its market cap peers, it may be a good idea to analyze it in detail and potentially include it in your portfolio. Our calculations showed that top 15 most popular stocks among hedge funds returned 21.3% through April 8th and outperformed the S&P 500 ETF (SPY) by more than 5 percentage points. Unfortunately ATH wasn’t in this group. Hedge funds that bet on ATH were disappointed as the stock returned 8.4% and underperformed the market. If you are interested in investing in large cap stocks, you should check out the top 15 hedge fund stocks as 12 of these outperformed the market.